The Colombian government in 2005 made the Bandeja Paisa (Paisa Tray) the national dish of Colombia. The Bandeja Paisa took its name from the Paisa region of Colombia. An area consisting of the departments of Antioquia, Caldas, Risaralda and Quindío (and some areas of North Calle del Cauca and West Tolima). Its origins are not fully known, and there are no records of the dish before the 1950’s. But it is believed to have evolved over time from peasant dishes, and the tinkering of Antioquian restaurateurs. The Paisa people with their own distinct linguistic, cultural and even genetic heritage, were now going to represent Colombia with their regional dish. This upset a few patriotic Colombians from other regions, who felt the dish was not fully inclusive to all of Colombia. Even with the suggestion to rename a variant of the dish to Bandeja Montañera (Mountain Tray). Not all Colombians were fully satisfied. Other dishes were considered for the honour, but none were found to be suitable. Sancocho and Ajiaco, the two nearest rivals, both having origins outside of Colombia. So the Bandeja Paisa weathered the storm, and remains to this day the national dish. This was largely thanks to the efforts of the Colombian tourist and restaurant industries. Who despite the opposition, marketed the Bandeja Paisa as the national dish . Today you will find it in restaurants across the country in different variations. The dish itself can only be described as a hearty variety of Colombian abundance. As is often with peasant food, the sustenance of the food is of vital importance. Local farmers working the mountainside and growing the coffee, is the idealistic vision of the Paisa region. The Paisas are well known for their hard work, and commercial acumen. A hearty meal was required to fuel their industriousness, and to keep them going throughout the day. The epitome of this can be seen in the Bandeja Paisa. Typical ingredients for the Bandeja Paisa are chorizo, frijoles rojos (red beans), arroz blanco (white rice), carne molida (mince meat), chicharrón (pork belly), huevos (fried eggs), plátano maduro (mature plantain), arepas (colombian flatbreads), hogao (a tomato sauce), morcilla (blood sausage), aguacate (avocado). Regional variations also include pork or beef steaks, offal, or green plantains. 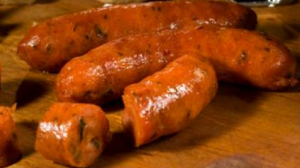 Colombian chorizo, if you are not familiar, is not to be confused with the Spanish chorizo. Colombians use the name chorizo for any coarsely ground pork meat sausage. As you would find in other South American countries. The chroizos are usually heavily spiced with paprika. Unlike their dry cured Spanish cousins, they are always cooked freshly. 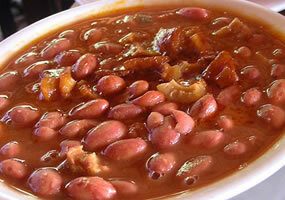 Frijoles rojos or red beans, and are a common addition to Latin American cuisine. In the Colombian style, they are usually slow cooked in a tomato based sauce. With finely chopped peppers, onion, scallions and garlic, and spiced with cilantro, achiote, cumin, salt and pepper. Properly prepared frijoles rojos colombianos are delicious. Pieces of pork fat are often added to the beans in some Bandeja Paisas. Carne Molida basically means ground meat, and would be known in English as minced meat. 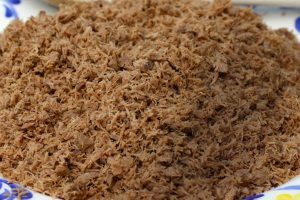 If prepared in a particular manner, it is also known as carne en polvo (powdered meat). This is very common for a Bandeja Paisa. A seasoned and spiced flank steak is boiled and then spun in the food processor until it is a powdery consistency. The meat alone can be a bit bland. It is often combined with various ingredients to jazz it up a little, such as onion or hogao. As a personal preference I always mix mine into the frijoles rojos. Que rico! Chicharrón is another common dish across South America, and probably across the entire Spanish speaking world. 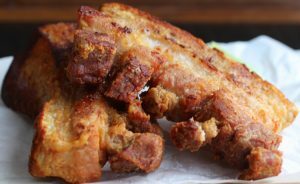 In Colombia it is a strip of pork belly that has been deep fried. On paper it sounds pretty unhealthy. Lets not beat about the bush, you dont want to live on a regular diet of chicharrón. However, the occasional one or two is not going to kill you, and they are pretty delicious. Because they are usually pretty crispy, they are not as greasy as you might imagine. Plantano Maduro are simply mature plantain bananas shallow fried. They can be prepared and cooked in a variety of ways, and on occasion patacones are used to replace them. These are unripe green plantains, fried, crushed, and re-fried. But the traditional versions usally stick with the mature plaintain. Morcilla is a blood sausage made with pigs blood. 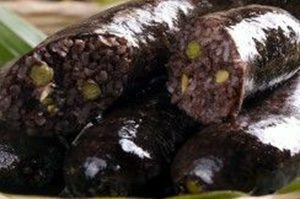 For British folk it is very similar to a Black Pudding. Except instead of oatmeal as a filler, morcilla uses rice, onions, and green peas, and tends to be spiced with cilantro and paprika. Its a little softer in texture than a Black pudding and often with a more flavoursome bite. I find the use of whole green peas in the Colombian Morcilla a bit off putting for some reason. However, I am not a fan of blood sausages in general, and I eat them sparingly. Arepas are usually the standard Colombian flatbreads made from maiz flour. You will find this with every meal, all across Latin America. Hogao, also known as criollo, is a tomato based sauce, sauteed with finely chopped onions, scallions, tomatoes, garlic, cumin, salt and pepper. Very much the same sauce as used for the red beans, but again the sauce can vary from region to region. It is an accompaniment to many Colombian dishes as a condiment, or as a base for a dish. The fried egg, rice, and avocado are all pretty standard fair. You will find your food often led snugly on a bed of rice, in one of the traditional Bandeja Paisa serving trays from where it takes its name. It is common to find is served on big plates as well. Very big plates! I have visited small restaurants for lunch around the country, who offer a mini-Bandeja Paisa for those who want to be still able to move after their meal. It begs the question, how did those Paisas manage to get any work done with a belly full of fried pork belly, and beans. I assume it takes some momentum building and a lot of practice. 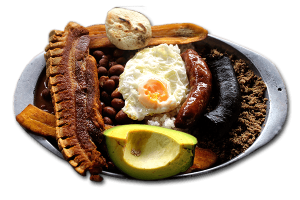 At first glances the Bandeja Paisa could almost be mistaken for the famous British cooked breakfast, until the avocado gives the game away. It is this combination of old indigenous and Afro-Colombian ingredients, with Spanish colonial foods that make this dish so uniquely Colombian. A true feast fit for a king or a peasant, as long as they have the stomach for it. The Colombian people will continue to debate its validity as the national dish. But its looks like its here to stay, and I for one, wont complain about that. Wow, that looks incredible. I need to try that.